Yesterday I went dancing with Neil Ayling and today things look different. 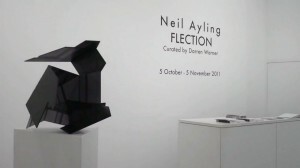 Locally based artist Neil’s first solo exhibition at the Eb & Flow gallery in Shoreditch runs until 5 November. If you are up for shifting the way you look at our urban environment, this is one for you. Neil takes flat static images and turns them into three dimensional dance partners. You have to dance; you can’t look at this exhibition without being compelled to move around each piece your eyes playing with angles, light, perspectives and textures. The exhibition is titled ‘Flection’, which means ‘the state of being bent or folded’. Neil works with wood, metal and fabric, with photographic images of parts of buildings or construction elements, and with graffiti that he has physically collected from the South Bank in its entirety before transforming it into free standing sculpture. I was blown away by Flection. Within a few minutes of leaving I realised I was looking at the nearby City Road in a whole new way. Later, back home in KX even the trees against the buildings became sights to play with. I’m not an art critic so I won’t presume to describe individual pieces, instead I give you a short film, a flavour of Flection using Neil’s words to describe what he does. When we put together a design brief for what was then called the Wharfdale Road Greenwall Project little did we know that Neil Ayling was out there and his approach to sculpture could not be more fitting for KX. We asked for a sculpture that would that would be home to deep level sustainable planting, that would change as the sun moves throughout the day, that would interact with the planting as the seasons change and the years pass and that would reflect the urban environment, history & culture of KX. To be honest, I thought this was far too much to hope for from an artist. I thought they’d baulk against having their work change over time. It’s a lot to ask that the work you have sweated over becomes entangled by greenery, that light casts shadows on stems, leaves and flowers that are not of your making – it’s all a bit scary for an artist, it’s not controllable. On top of that the sculpture would have to act as a massive planter or series of planters holding large amounts of soil. It would have to have elements of trellis or some means of climbing plants grabbing hold as they grow ever upwards. The density of planting is important to help clean the air of nasty particulates from vast amounts of traffic and to be home to urban wildlife adding to the KX green corridor. And lastly, the sculpture had to be a stunning piece of public art drawing inspiration from its location at the north end of the busy KX gyratory system. As the project has developed, I have been very impressed indeed by Neil’s approach to our impossible brief. Having seen Flection I understand a little better why it’s quite possible our project and Neil Ayling were made for each other.